Religion in the public sphere is one of the most debated issues in the field of law and religion. This volume brings together articles which address some of the more prominent recent cases relating to religion and education, religion and the workplace, family law and religious symbols. The essays discuss the meaning of secularism today and the difficult issue of religion in the public sphere and reflect a wide variety of viewpoints. This volume maps the key elements of this multi-faceted problem, offers essential material and provides an important starting point for an understanding of the issues in this century old debate. 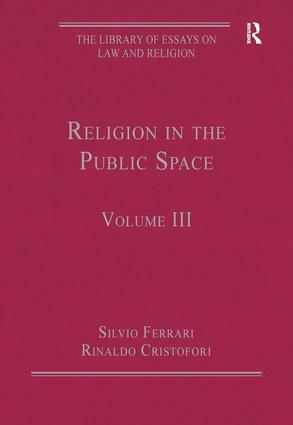 Contents: Introduction, Silvio Ferrari; Part I Secularism, Pluralism and Multiple Modernities: Religion in the public sphere, JÃ¼rgen Habermas; The meaning of secularism, Charles Taylor; The transformations of the religious dimension and the crystallization of new civilizational visions and relations, S.N. Eisenstadt; Secular constitutionalism vindicated, Frances Raday; Religious liberty and French secularism, Jacques Robert; The distinctiveness of Indian secularism, Rajeev Bhargava. Part II Law, Religion and Education: Religion and education, Jeroen Temperman; The religious, moral and spiritual dimensions of education: national, regional and international constitutional and legal frameworks, Peter Schreiner; Different models for religion and education in Europe, Jean-Paul Willaime; Religion education and the transformational state in South Africa, David Chidester; Religious education in Israel, Asher Maoz. Part III Law, Religion and the Workplace: Protecting religion at work, Lucy Vickers; Class wars? Religion and (in)equality in the workplace, Aileen McColgan; God at work: religion in the workplace and the limits of pluralism in Canada, Lorne Sossin. Part IV Religion and Family Law: State, law and family, Mary Ann Glendon; The place of religion in family law: a comparative search, Jane Mair; The overlooked costs of religious deference, Robin Fretwell Wilson. Part V Religious Symbols in the Public Space: Ancient and modern boundary crossing between personal laws and civil law in composite India, Werner Menski. Unveiling the limits of tolerance: comparing the treatment of majority and minority religious symbols in the public sphere, Susanna Mancini and Michel Rosenfeld; Crosses and culture: state-sponsored religious displays in the US and Europe, Mark L. Movsesian; Name index.